When you can't take it home with you try a soft bonnet hair dryer. A soft bonnet hair dryer is an easily wieldable model of the traditional bonnet dryer. Designed to provide salon-dryer quality results at home, a soft bonnet dryer can be used for drying, deep conditioning, and for hair treatments requiring heat activation, roller and precision styling. Moreover, the dryer's foldable headpiece can easily be tucked away for traveling. Whereas standard hand dryers are excellent for piece by piece styling and straightening, a soft bonnet dryer can tend the hair as a whole, making it ideal for a completely uniform drying session. This overarching method of drying is ideal for many situations, including hair treatments, large rollers, and wigs. A variety of protein and hair repair treatments include instructions that require the wearer to run the formula through damp hair and let the substance remain in the hair for an extended period of time. These repair treatments are able to permeate the hair shaft more thoroughly when heat is applied. However, using a shower cap and a standard hand dryer to run heat over the hair can result in a slow time-consuming process that does not distribute heat evenly. A soft bonnet hair dryer placed over a shower cap (so as not to catch the formula on the actual bonnet piece) is just as effective as a salon dryer that distributes an adjustable level of even heat to the entire head. This method of drying also greatly reduces the strain on your arms! Examples of excellent hair repair treatments include the Frederic Fekkai Technician Color Care Mask and the Ojon Restorative Hair Treatment, both of which can be used with the complimentary aid of a soft bonnet hair dryer to restore sheen and manageability to overly-processed hair. 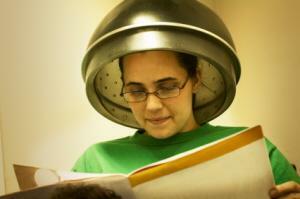 One of the most common uses of a soft bonnet hair dryer involves drying of hair styles that employ large rollers. Roller styles require evenly applied heat to prevent breakage and over-drying; the soft bonnet dryer is ideally suited for this purpose, not to mention the amount of time that is saved simply by being able to dry the hair while the rollers are in place (as opposed to drying the hair, then placing the rollers, thereby making the styles' staying power dependent on hair sprays and other styling products). The headpiece of these soft bonnet dryers is usually large enough to extend over the entire jumbo roller-adorned head, and drawstrings are provided to keep the bonnet in place. What could possibly be easier for drying wigs and hairpieces than a bonnet dryer? Once again, this method of drying drastically cuts down on the amount of manual involvement. Most soft bonnet dryers come with adjustable heat settings, which is particularly useful for the styling of synthetic wigs and hairpieces because these materials should never be exposed to more than a low heat setting. An over-exposure to heat will cause damage to the synthetic hair, causing breakage and sometimes complete shaft destruction. Most soft bonnet dryers employ the same protocol. The hose is attached to the bonnet piece and the actual dryer (vents positioned upward). Always keep the dryer on a firm level surface so that there is no vent blockage. Hair can be towel-dried before the bonnet is placed atop the head to eliminate excess moisture and further speed drying. The rest of the process is simple: turn bonnet on. Place feet on elevated surface. Read fashion magazine…and presto! You have a provocative hair style with minimal time and effort. To ensure your styling ease, it is recommended that the bonnet dryer (an electrical appliance) be kept away from water at all times, even when the dryer is set to "off". A soft bonnet hair dryer can be purchased from most beauty stores and superstores such as Target. Both Vidal Sassoon and Conair have soft bonnet dryers available on the market. These products can be purchased in stores or online at Amazon.com. Professionally styled hair never came so easy!